Located 2.5 miles from downtown Sturgeon Bay, this is the perfect place to unwind from it all. 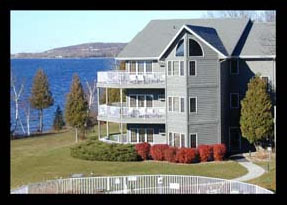 Established in 1922 as a seasonal resort, Bay Shore Inn was transformed into year round condominium buildings in 1991. This family friendly resort with breath-taking sunsets sits across the bay from Potawatomi State Park. Our spacious 1 and 2 bedroom water view suites include: king size beds, double whirlpool tubs, fully equipped kitchens, living and dining room areas with a private balcony or patio.